Everyone once in a while, I am reminded of how subjective our interpretations of movies can be. 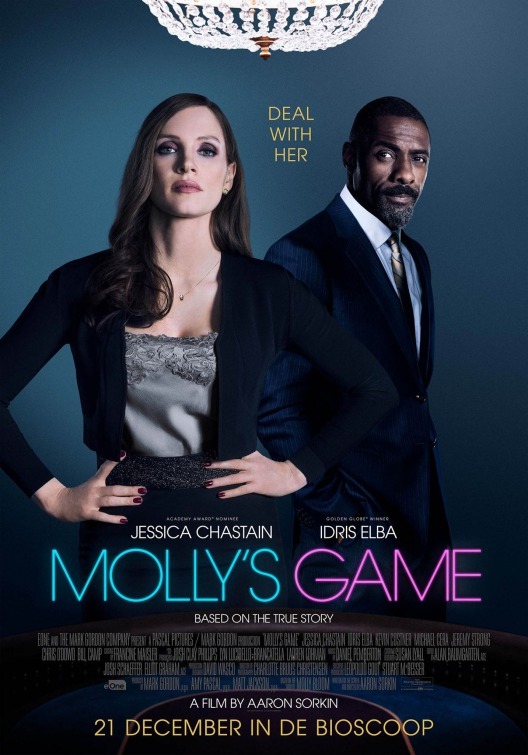 I recently reviewed Molly’s Game, a biopic of “Hollywood Poker Princess” Molly Bloom (see also here). I really enjoyed the movie. I thought Aaron Sorkin’s screenplay was snappy and engaging, Jessica Chastain well cast in the title role, and the directing was inspired. This entry was posted in Film making, Film Reviews, Films, writing and storytelling and tagged film making, Molly's Game, movie making, movie reviews on January 29, 2018 by SR Staley. Molly’s Game is a just the kind of movie you would expect from Aaron Sorkin, the creative light behind TV series like The West Wing and movies like The Social Network. His fast-paced dialogue allows his characters to carry a lot of attitude into the movie and story, and Molly’s Game is no exception. As in most Sorkin scripts, Molly’s Game has many layers. He uses the unusual technique of having Molly narrate most of the movie. This useful device allows for the story to be told largely in flashback while creating tension with the no-nonsense Jaffey. Aside from the conflict between Bloom and Jaffey, the narration/flashback structure serves two other important roles. First, audiences see Molly evolve from a brash, arrogant, determined, Type-A athlete to a more humble and circumspect women who has been tamed by the cruel and violent world of underground gambling. She goes from bratty teenager to an adult with faults that are real and relatable. Second, audiences come to appreciate Molly’s personal journey through Jaffey’s skepticism, and then empathy. Just as Bloom appears to be at her lowest point, resolved to go to prison for decades because she won’t give up her clients, Jaffey is able to provide the support she needs because of his sincere belief in her innocence. This entry was posted in Film Reviews, Films and tagged Aaron Sorkin, film review, Jessica Chastain, Molly Bloom, Molly's Game, movie review on January 25, 2018 by SR Staley.